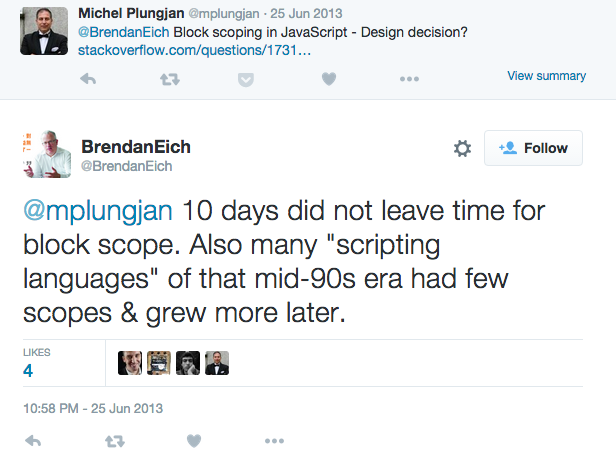 Eich eventually decided that a loosely-typed scripting language suited the environment and audience, namely the few thousand web designers and developers who needed to be able to tie into page elements (such as forms, or frames, or images) without a bytecode compiler or knowledge of object-oriented software design. And now, finally, ECMAScript 6 (ES6) is here and among many things, it gives us block scoping via the two new ES6 variable keywords, let and const. Support for let/const is still limited to Edge, Chrome, and Firefox but more browsers will likely support it soon. This post will explain why const and let are helpful and how they are used. In the above example, var foo = 10; is hoisted up to the nearest parent function. 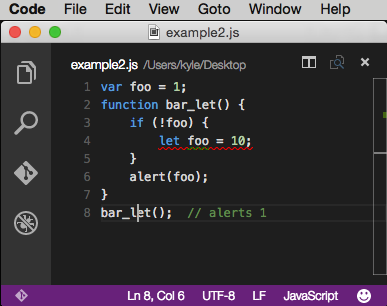 That’s why it alerts 10 even though you might think you would get a “ReferenceError: foo is not defined”. 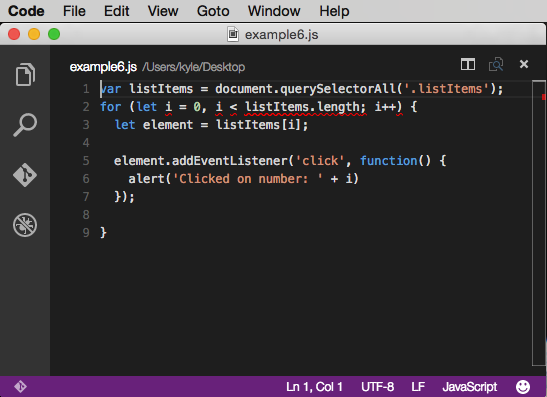 The example refactored with let is more intuitive. 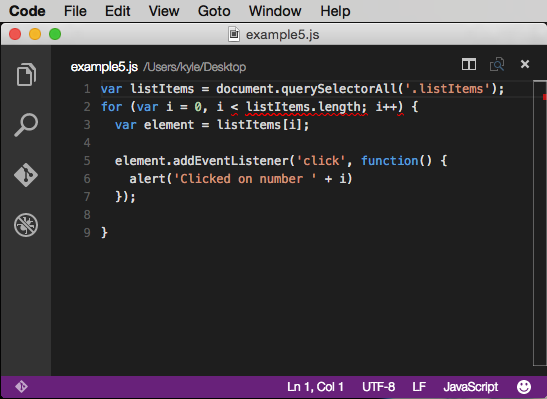 The new ES6 keyword let allows developers to scope variables at the block level (the nearest curly brackets). If you’d like to see which browsers support let (and const) follow the Microsoft Edge page for tracking support across ES6 features. You can also check here if your current browser supports let and const. 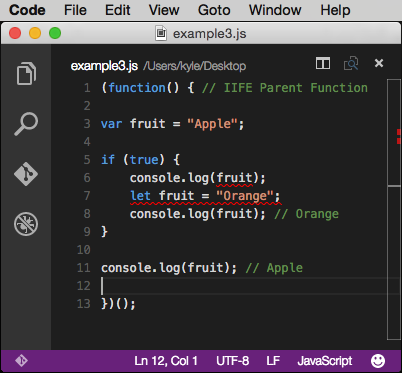 In the above example, the variable is scoped to the IIFE function when it’s declared with var. Within the if block, a separate fruit variable is declared with let and scoped to the if block. In this example, the code is meant to register an event listener on a simple list and alert which number was clicked. Instead, it will alert Clicked on Number: 5 for each list item. 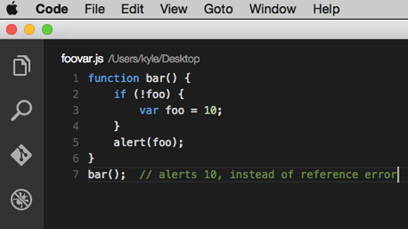 Wrapping the event listener part in a function would be a common workaround for avoiding the accidental closure. But instead, refactoring this with let (once it’s fully supported) creates a block scope in the for loop and avoids the accidental closure. It allows the expected iterator to be used within the event listener callback function. One caveat with let is that it doesn’t hoist in the same way var does. If you try to use it before it’s been declared, you will get a reference error. This has been termed the Temporal Dead Zone by one developer (the term has gained popularity since). Like constants in other languages, const will often be used for values that won’t need to be reassigned in a program’s execution. Strings like API keys or numbers like CANVAS_HEIGHT would be uses cases of const variables that don’t need to be reassigned. Variables declared with const are often written in all caps, but this is a matter of preference. 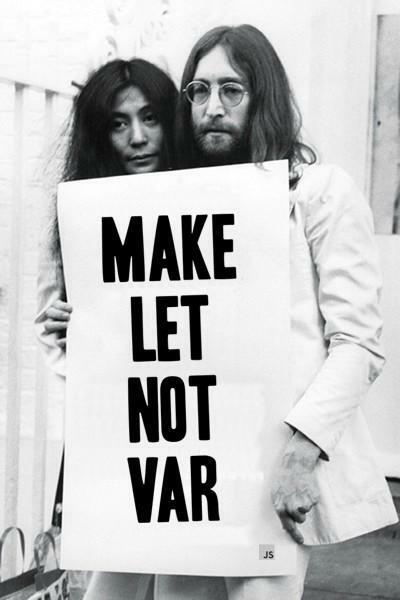 They do not contain values; they grasp them — two variables can refer to the same value. A program can access only the values that it still has a hold on. When you need to remember something, you grow a tentacle to hold on to it or you reattach one of your existing tentacles to it. If you want a constant to be completely immutable, use object.freeze to make the properties immutable. If I don’t need to reassign, const is my default choice over let because I want the usage to be as clear as possible in the code. 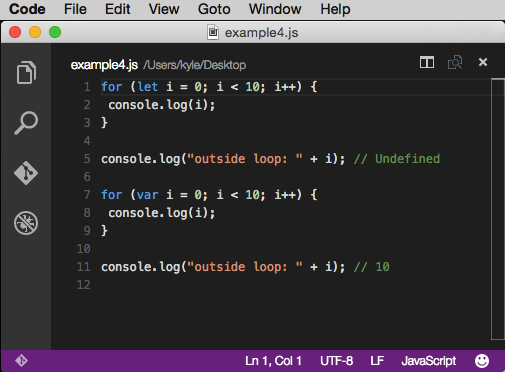 const is a signal that the variable won’t be reassigned. let is a signal that the variable may be reassigned, such as a counter in a loop, or a value swap in an algorithm. It also signals that the variable will be used only in the block it’s defined in, which is not always the entire containing function. var is now the weakest signal available. Simpson believes that let is the companion to var and that it shouldn’t be used to replace all var statements. It’s still to be determined how this debate will shake out.